Here's why Swedish college students still graduate with a ton of debt. Swedish colleges and universities are free. Yep. Totally free. But students there still end up with a lot of debt. The average at the beginning of 2013 was roughly 124,000 Swedish krona ($19,000). Sure, the average US student was carrying about 30% more, at $24,800. But remember: Free. College in Sweden is free. That's not even all that common in Europe anymore. While the costs of education are far lower than in the US, over the past two decades sometimes-hefty fees have become a fact of life for many European students. Britain got them in 1998 . Some German states instituted them after a federal ban on student fees was overturned in the courts. 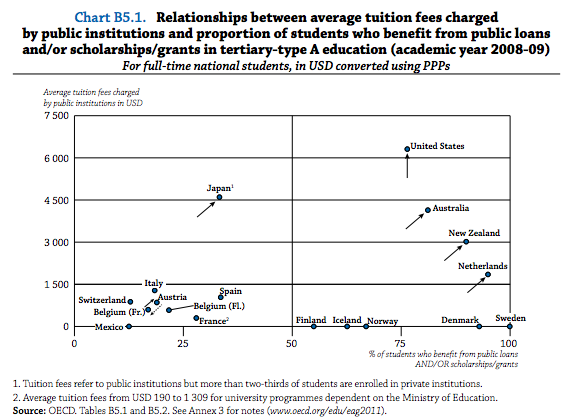 In fact, since 1995 more than half of the 25 OECD countries with available data on higher education have overhauled their college tuition policies at public institutions , with many adding or raising fees. And yet, students in Germany and the UK have far lower debts than in Sweden. And 85% of Swedish students graduate with debt, versus only 50% in the US. Worst of all, new Swedish graduates have the highest debt-to-income ratios of any group of students in the developed world (according to estimates of what they're expected to earn once they get out of school)--somewhere in the neighborhood of 80%. The US, where we're constantly being told that student debt is hitting crisis proportions, the average is more like 60%. Why? College in Sweden is free. But rent isn't. And food isn't. Neither is the beer that fuels the relatively infrequent, yet legendary, binges in which some Swedes partake. Costs of living in Sweden are high, especially in cities such as Stockholm, which regularly ranks among the world's most expensive places to live. But again, this stuff isn't free for students in other European countries either. So why do Swedish students end up with more debt? It's pretty simple, actually. In Sweden, young people are expected to pay for things themselves instead of sponging off their parents. This is Ellie . She's 22 years old and lives in Stockholm, where she studies engineering and media technology at the Royal Institute of Technology. There's no tuition to pay for the five-year course of study. And because she is from Stockholm, Ellie was able to live at home with her parents for the first couple years of her university career. "My parents told me, 'You are very stupid to move out because every month you save like 4,000 kroner,'" she said. In a way, she's an outlier. Sweden population of roughly 9.1 million--smaller than Belgium's--is sprinkled pretty evenly over a geographic expanse greater than Germany's. So for many Swedes, living with mom and dad while attending school isn't an option. But Ellie is also like most Swedish students, in that she's taken student aid from the Centrala Studiestödsnämnden, or CSN , the state-sponsored entity that distributes student aid in the form of grants and loans. "Everyone takes the grants," she said. "Almost everyone takes the loan as well." She's right. According to data collected by the OECD, despite nonexistent tuition costs, Sweden has a virtually 100% uptake rate on student aid. That's why Sweden is all by itself in the bottom right corner of this chart, although its Nordic neighbors are not far behind. Swedes, like other Nordic Europeans, have an independent streak. They leave their parental homes earlier than almost all their southern neighbors. One study found that just 2% of Swedish men lived with their parents after the age of 30. In Spain, a quarter of 30-year-old men still are shacking up with mom and dad; in Italy it was around 32%. Nobody's exactly sure why this is. One of the more fascinating theories is that the differences in the strength of family ties in northern and southern Europe is a faint echo of invasions by the Roman Empire and Islamic caliphates in the Mediterranean region versus the Germanic-Nordic dominance in regions further north. Or it could reflect the fact that back in the middle ages, young people in northern Europe were often sent out to work as servants outside the family home. Others simply argue that it's the economy, with low wages and high housing costs conspiring to keep southern Europeans living at home. Whatever the reason, ideas about youthful independence are embedded in the system Sweden devised to pay for higher education. For example, whereas in the US parents are expected to help pay for the their children's college education, in Sweden parental income levels are just not part of the equation. Students are viewed as adults, responsible for their own finances. As a result "levels of student support are based on students' own income, rather than that of their parents," wrote analysts in a white paper on the system. Compare that to countries like Germany, where any aid from the state agency that doles it out, known as BAföG, is premised on parental income. In the US it's the same deal. In Sweden, the entire system is aimed at severing the financial link between parents and young adults. "The main point is to take away the family's situation," said Torbjörn Lindqvist, an analyst at the Swedish Higher Education Authority in Stockholm. "And look at the student as a grown up standing on his own feet." This is the key. While Swedish students end up with relatively high levels of debt, the monthly costs of carrying that debt are pretty cheap. (It's about 3.8% of estimated average monthly income of new graduates, according to one study.) Interest rates are low. They're set by the government and maintained through subsidies. And the length of repayment is long: 25 years or until the student turns 60. In other words, the Swedish system of student debt is financially manageable and sets students up to begin their lives as viable adults separate from their parents. Compare that to the US system, where high levels of debt are increasingly impeding young people from taking on the trappings of adulthood . A recent study by the Federal Reserve Bank of New York found those with student debt retreating from purchases of cars and homes , for example. Sure, automobiles and houses are nice. But if you're looking for indicators of adulthood, the must-have accessory is a human infant. And, in a way, that's sort of what this is about. Across Europe, slumping birth rates represent a long-standingeconomic, demographic and social problem. Sweden, though, is something of a hotspot for European baby-making. Some see clear links between young people moving out of parental homes early and taking the necessary steps to become parents themselves. (Anyone who has ever lived with mom and dad into their 20s will understand this intuitively.) "Childbearing in developed countries almost invariably takes place after young adults have left their parental home, and home-leaving constitutes a central correlate of fertility and union formation in Europe and other industrialized countries," wrote sociologists in this 2006 paper. With American students, recent graduates, and their families staggering under a growing pile of debt, it's becoming clear the US must change how it pays for college. The Swedish-style, state-led solution will be a nonstarter in the US of A. But the Swedish system helps clarify exactly what student debt is about. It's not just a method of paying for books and professors. In a broader sense, student debt is just our solution for an age-old problem. It's society's way of financing a restructuring period for the currently unproductive assets it will depend on in the future: young people.